As we celebrate another year and take some time to rejuvenate, it’s humbling to reflect on all that 2017 brought us as we partnered with mission-driven organizations in Detroit, across Michigan, and nationally. We thank our partners and communities for allowing us to collaborate, serve, and lead with you in 2017—and beyond. We also thank those who have engaged with us and supported in a myriad of ways. These reflections and highlights from 2017 wouldn’t be possible without a vast local and national community committed to mission-driven work—thank you! In 2016, the Michigan Department of Education’s Office of Educator Talent brought us on board to build a campaign to celebrate educators—based on the Michigan Equity Plan—which came to be known as the #proudMIeducator campaign. With a social media campaign across platforms, as well as a monthly video feature of an educator from every region of the State, we uplifted the great work of teachers. Recognizing the power of educators’ voices, we also launched a monthly blog. We designed a three-phase campaign, with each phase co-existing with the prior. July 2017 marked one full year of the campaign—and it continues! 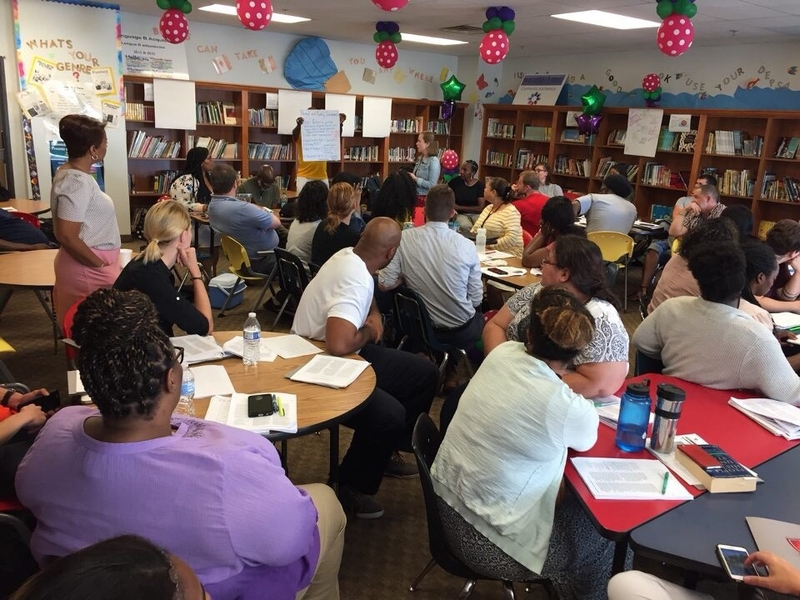 Through the first quarter of 2017, we partnered with The Skillman Foundation to host Teacher Listening Sessions. These sessions allowed us to get a better pulse on what teachers want and need. An impact report was prepared that was included in knowledge downloads with leadership across the city, business community, and education landscape—leading with teacher voices. Throughout 2017, we partnered with the Campaign for Black Male Achievement (CBMA) to design and launch the inaugural CBMA Detroit Advisory Board; design and host quarterly partner and staff deep-dive days; launch the national inaugural Building Beloved Community Leadership Fellowship; host the first-ever regional Rumble Young Man, Rumble! 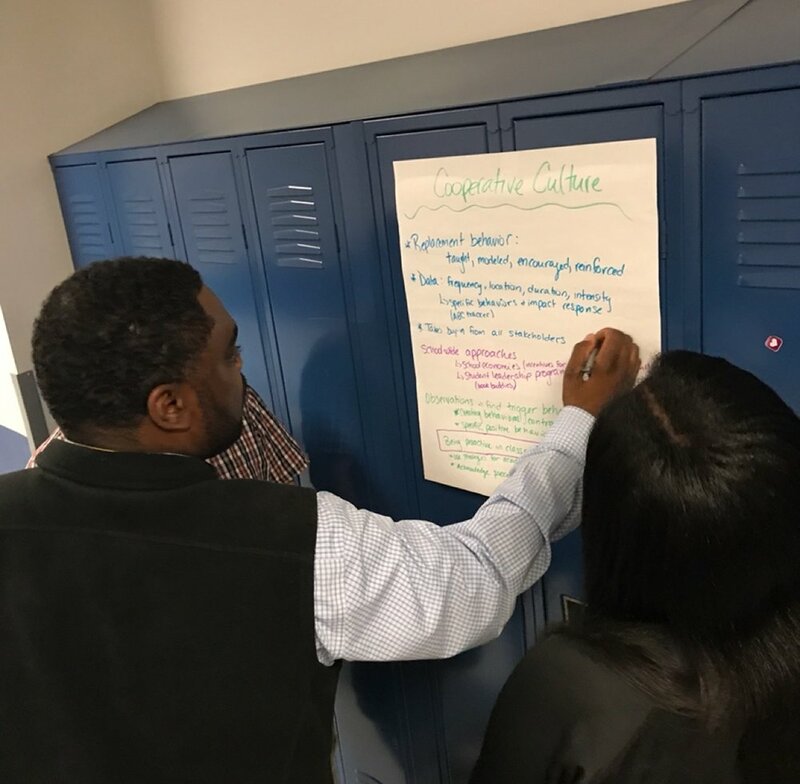 in Detroit; partner to further High School Excellence with brilliant educators at Frederick Douglass Academy for Young Men (located in Detroit) on the FD Promise, CBMA Literacy Corps, and CollegeSpring PSAT Preparation; as well as overall strategic planning and reporting with the national Strategy and Innovation Team. The impact of CBMA in Detroit, as well as nationally is undeniable—we are deeply grateful to partner with them! In July, we moved into our new offices at Bamboo Detroit. We are proud to say we’ve been with Bamboo since 2016, yet as they have grown, so have we! The new 4th floor suites of Bamboo Detroit are home to our Hampton Consulting Detroit office. Visit Bamboo today for a tour—or check out their social media platforms to learn about networking and professional development opportunities. We’ve had a blast partnering with New Paradigm for Education (NPFE) this year. We built out a strategic recruitment plan in partnership with NPFE’s Superintendent and district leadership with a goal of getting NPFE’s schools fully staffed for the 2017-2018 academic year and beyond. NPFE began the school year fully staffed, including a waitlist of qualified candidates for several roles. In addition to leading recruitment, we’ve also launched partnerships and an overall talent continuum for the district. Since 2015, we’ve been working with the Office of Academic Multicultural Initiatives at the University of Michigan and a cohort of 300 brilliant high school students via Gaining Early Awareness and Readiness for Undergraduate Programs (GEAR UP)—Michigan’s largest college access program. This fall, OAMI hosted a Matriculation Ceremony for GEAR UP students who are attending the University of Michigan. These young brilliant minds are trailblazers and we are so proud of them completing their first semester of college! United Way for Southeastern Michigan’s Vice President of Education, Tammie Jones, had a powerful vision for opportunities and access that every student in Detroit should experience—including large-scale, college and career readiness fairs. We partnered with United Way to design a fair continuum for not only high school students, yet middle schoolers. 2017 marked the first year and two of three fairs that will be hosted annually. In May, United Way partnered with Grow Detroit’s Young Talent, Detroit Employment Solutions Corporation, Downtown Detroit Partnership, and the Mayor’s Youth Workforce Sub-Committee to host the Career Connections Fair. The fair engaged 687 youth attendees, resulted in over 300 job offers, and engaged over 80 partners and facilitators, 115 volunteers, and 65 employers. In November, we focused on high school freshmen via the Find Your Future: Career Exploration Fair. This fair engaged more than 1,800 freshman students from across 25 high schools from Detroit Public Schools Community District. Students were able to engage in 15 workshops hosted by 18 facilitators, 52 career exploration booths staffed by 175 partners, a social-media lab, professional headshot station, and on-site high school and college advising sessions. The work we do at Hampton Consulting wouldn’t be possible without our great team members; people make an organization, and we are fortunate to have amazing people! In June, we welcomed Alaina Dague as our Senior Consultant. In September, Tori Lee joined us as our Special Projects Coordinator. We were also thrilled to welcome Jeniqua Davis as our Executive Assistant in October. This dream team has made our work possible and continues to progress and grow our organization’s impact—we cannot thank them enough! Find Your Future: Career Exploration Fair hosts nearly 2,000 youth! Earlier this month, Hampton Consulting had the honor and privilege of continuing to partner with United Way for Southeastern Michigan (UWSEM) to host the Find Your Future: Career Exploration Fair (Find Your Future) as part of their Education team’s efforts to ensure college and career readiness for Detroit youth. Find Your Future engaged nearly 2,000 freshmen students from 25 high schools across Detroit Public Schools Community District. Find Your Future provided a space for high school freshman to plan for life, make connections, and build career awareness. Diverse and robust programming included 15 workshops, from building healthy relationships; to defining success in high school and creating an aligned plan; to applying and paying for college; to launching a strong career immediately after high school. In addition, 52 companies, organizations, and government and civil service entities hosted unique career exploration spaces that ranged from engineering to the arts. Ten college and university partners also joined us for the day to share post-secondary educational opportunities for students. As one student eagerly expressed, “I can’t believe all of this is for us! We [standing with two friends] went to the session on college [applying and paying for college]. It was really helpful…I wish everyone our age could get this information. Today was great! The energy was simply incredible. As one partner shared, “I’ve never had the opportunity to connect with this many students!” We are thrilled to have contributed to such a powerful and important day. The United Way for Southeastern Michigan's mission is to mobilize the caring power of Detroit and Southeastern Michigan to improve communities and individual lives in measurable and lasting ways. Within their education work, the College and Career Pathways Team leads a Linked Learning model in partnership with schools across Detroit. United Way enlisted Hampton Consulting to partner with the College and Career Pathways Team to create a continuum of fairs directly intersecting with their education work across Linked Learning schools. The Find Your Future: Career Exploration Fair was the second of three fairs in an annual continuum. Hampton Consulting led collaborative design efforts, including focus groups with high school freshman, to create a vision and detailed programming for these events. Ongoing planning, youth recruitment, as well as all facilitator and partner engagement for this fair were led by our team. Want to learn more? Here are some additional great blogs--from both our partner in this work, United Way for Southeastern Michigan, and one of our fair career exploration partners, DTE. Last week, we had the privilege and opportunity to join forces with the Community Foundation for Southeast to host On the Table, a community dialogue about what we hope to see for our youth, with our office partners and dear friends at Bamboo Detroit. And we didn’t do this alone--we were part of a greater collective of over 400 organizations and community leaders hosting these conversations across seven counties in Southeast Michigan. Forty community members and youth advocates joined us for lunch at On the Table. What brought them here? We asked this question as they walked into the cafe--asking each attendee to share this in one word on a whiteboard. 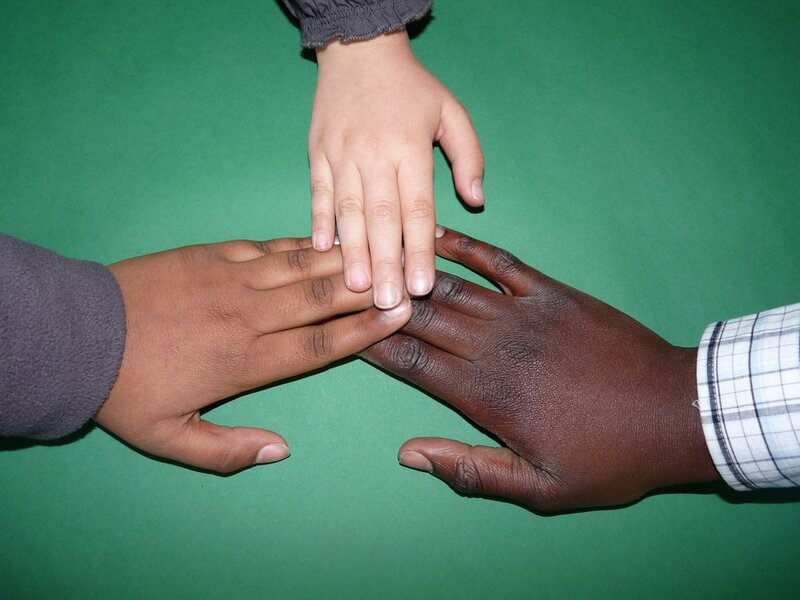 Kids...Equity...Love...Hope...Community. Some were retired educators; others were working in our schools with youth today. Non-profit leaders, foundation staff, and corporate professionals committed to responsibly contributing to education...they were all around the table. One of these people was Mary--a community advocate who has been in this work for decades. Mary engaged us in a powerful exercise that asked us not what we want to see for youth, but to speak as if we are ten years in the future. She encouraged us to claim and affirm what we see in the year 2027 for youth across our region. There was an instant shift in body language, tone, the air of the room. It was one of hope, one of conviction, one of belief. Participants spoke of collaboration and equity, a region where all children are thriving, happy, and healthy. Some even shared that they hadn’t considered reaching this place, yet speaking as if it is, put them in a different space--and that is what our youth need, a community that believes in them and acts accordingly. What is the area you want to focus on to serve our youth? If you had $1,000 handed to you today, what would you do to get started or continue that work? The Awesome Foundation wants to know! Click here to learn more about this organization and to apply today. Vote! Our legislation and policies that we have a voting right in impact our community, our youth, and our lives as a whole. Don’t stand by idly. In Michigan, you can register to vote by mail and in person by submitting a completed State of Michigan Voter Registration Application (Form ED-121) to your city or township clerk. County and municipal elections are taking place across Michigan as well. Find more information about your ballot here. Click here to learn more and stay engaged with On the Table. We are deeply grateful for those who joined us at On the Table, for those who joined other On the Tables last week, and for all who are doing work in service of our youth in our region each day. How Are You Using Convenings to Meet Your Q4 Goals? A commitment to and partnership with community and community-based organizations are part of our DNA here at Hampton Consulting. Any and all who are in community-driven work (whether an educator, a non-profit program manager, or the CEO of a foundation) or connected to community in any way know what a busy time of year we are in right now! The school year is here, we are in the last quarter of the year (time is flying and there is so much to be done! ), planning for fiscal year 2018 is here, and more. Through all of this, we are knee-deep here at Hampton Consulting in planning a number of convenings in Detroit as well as other parts of the country. A question to ponder: Are convenings in your fourth quarter plan? What about your 2018 calendar of engagement? Convening power is priceless and its value is infinite. Not just anyone can convene a collective. It’s even tougher to convene and make progress toward a given goal—versus just getting together for conversation and debate or purely surface level entertainment. If you have convening power, how are you using it to reach your goals? If you do not have convening power, who are you collaborating with and leveraging to make this happen? Convenings can accomplish more in 4 hours or a couple days than in a month. There is something about creating a space for people to be present, focus, and physically come together that leads to a 15-minute conversation with that person you’ve been playing phone tag with for weeks or aren’t scheduled to meet with for another month. A 15-minute conversation in a place of convening can get more accomplished than a 4-hour meeting in the midst of a day full of other stuff. Can you think of a conference or convening you’ve been at where you accomplished more in that time than you felt you had in a month...or a quarter? How do you make this happen on a consistent basis? What happens after convening is just as important, if not more, than what actually happens at the convening. Depending on the type of convening and your vision/goals for the space, the follow-up, next steps, and future benchmark touchpoints may be even more important. Do you need a convening catalyst to launch a major project or initiative? To re-spark productivity or collaboration? To what end should this convening be and how do you continue the momentum from this space? As you think through the power of convenings and how you are hosting or engaging in these spaces to further your purpose and goals, consider Hampton Consulting as a capacity-building partner--whether in a design capacity, as an execution leader, or both. We’d love to connect and partner with your mission-driven organization! Photo courtesy of New Paradigm for Education. We are proud to be working with New Paradigm for Education (NPFE) to staff their district for the 2017-2018 school year, as well as build and grow additional talent infrastructure and partnerships. NPFE operates seven school campuses throughout the City of Detroit and specializes in maximizing student learning potential through proven educational practices. Their schools offer a new educational paradigm evident by increased student achievement, fiscal responsibility, and community support. While innovation is great, strong execution is key. Leverage your network--this includes your greatest assets: your existing staff. Cast your net wide. One strategy will not get you fully staffed, yet multiple strategies being simultaneously executed strongly, will. In our last week of the hiring season for the 2017-2018 academic year, consider joining NPFE! If you’d like to join the NPFE team, we do have a few classroom roles still available! Email adague@npfeschools with your resume and a copy of your Michigan Teaching Certificate to apply today! Alaina Dague recently joined our team as a Senior Consultant. She took some time recently to reflect on her year-long transition from the classroom, through two fellowship positions, and into this new role. Read more about her experiences here. We're thrilled to have Alaina on the Hampton Consulting team! After a few months of long, intense, impactful work, our Founder and President, Chanel Hampton, stopped and reflected. Here's what she had to share. Hampton Consulting is thrilled to announce our newest addition to our staff! Hampton Consulting is thrilled to announce our newest addition to our staff! Join us in welcoming Senior Consultant, Alaina Dague, to the Hampton Consulting team! Alaina earned her Bachelor of Arts in Political Science from Alma College and also holds a Master of Arts in Educational Studies from the University of Michigan-Ann Arbor. In addition, she serves as Vice Chair of the Young Nonprofit Professionals Network-Detroit, is a member of the Executive Team of the Detroit Young Professionals, and is active in the Junior League of Detroit. More Than 300 Detroit Youth Hired at Career Connections Fair! Hampton Consulting deeply believes in holistically and unapologetically serving our youth. For these reasons and beyond, we were honored to serve as an integral partner with United Way for Southeastern Michigan, Grow Detroit's Young Talent, Detroit Employment Solutions Corporation, and Mayor Duggan's Youth Subcommittee to host the Career Connections Fair on Friday May 12, 2017. The excitement began early Friday morning with volunteers and students arriving early--even a couple hours earlier for some of our youth--their parents were that excited! Engaging throughout the day, we had students, partners, employers, and speaking to all that was brought to the table for our youth. Over 300 youth walked away with jobs from the Career Connections Fair! Our youth were prepared to succeed on the job--having tools to budget their money, balance their time, and rock their first day on the job (and beyond)! From a strong and authentic elevator pitch to being confident to leveraging social media in all the right ways--our youth (and even parents who attended with their youth) walked away that much more prepared to get the job! Furthermore, hundreds of youth walked away with questions, curiosity, and further interest in career pathways, more information about colleges and universities, as well as resources to support them along the way! This holistic effort, while tedious and intense, was all worth it--seeing our youth, partners, and employers! Over the past week, we've run into youth and parents who attended, as well as partners and employers--they are still raving about the power and impact of the Career Connections Fair. Over the summer, hundreds of youth will continue to reap the benefits of the fair--serving as amazing employees with companies, organizations, and even school districts throughout the City of Detroit. A heartfelt thank you to each of our workshop facilitators, partners, and employers. Youth, congratulations on being hired and a round of applause for your engagement in your development as a young professional! Eighteen months ago, I left an extremely lucrative and fulfilling career to venture out on my own to launch Hampton Consulting, a mission-driven consulting firm. While the initial success of my company was driven by me*, it quickly became clear that the continued success of my company would be dependent on a team. Here are five things I have learned over the past year and a half about building your dream team. In December 2015, Detroit Young Professionals (DYP) featured our Founder and President, Chanel Hampton, celebrating her return home to Detroit and her launch of Hampton Consulting. A year later, DYP wanted to reconnect with Chanel to see how Hampton Consulting is doing, advice, and learned lessons. Founder and President Chanel Hampton sat down and connected with DYP to share. Check it out! Although January has come to close, we continue to feel energized by our 2017 goals. We are always reflecting on how we can best support our clients and partners in achieving their goals as well. Hampton Consulting is eager to further expand our mission-driven work this year and to keep partnering with organizations who are creating meaningful change throughout the region, state, and country. We have a plan for our goals and couldn't be more excited! Entrepreneur Media, Inc. has some great tips on how to Make 2017 Your Year. We love the book recommendations. What about you? From kangaroos and other visiting Urban Zoo animals, to holistically educating students and supporting all of their needs, to keeping the dream alive...This is what the work of Hampton Consulting is all about. We were honored to visit Highland Park Renaissance Academy earlier this week and are thrilled to continue uplifting the incredible work of this school and of so many other mission-driven partners who impact our community. Here at Hampton Consulting, we are deeply committed to supporting the goals of our mission-driven clientele. We bring passion, excellence, and integrity to our everyday work and intentionally partner with organizations who do the same. Whether we're providing expertise in matters of diversity, equity, and inclusion; education; leadership development; operations optimization; or recruitment, Hampton Consulting knows that the ultimate value in our work is helping each client achieve their specific goals. Perhaps this is why Entrepreneur Magazine's recent article on achieving success by helping others resonates so strongly with us. The author reports, "I have been researching what it is [that people and organizations seek] beyond success. It is not just more success. I keep hearing the need for significance in the hundreds of interviews with amazing leaders and entrepreneurs." We've found signficance in our work helping others, and we completely agree. Over the course of our first full year of operation, 2016, Hampton Consulting was humbled and honored to live out our vision and mission, ultimately offering best-in-class consultation and execution services which positively impacted (and continue to impact) the short- and long-term mission, productivity, and culture of our direct and indirect clients. We partnered with the Michigan Department of Education (MDE) on the State Equity Plan, including creating, launching, and driving the Proud Michigan Educator Campaign. Our work with MDE serves all districts and public school entities across the entire state, all Michigan educators, and all 1.5 million students. We led parent/family workshops, Saturday Academies, and senior seminars with tens of families and 100 students in partnership with the University of Michigan’s GEAR UP Program throughout the year. We were ecstatic to serve the City of Detroit, my hometown, in leading recruitment, marketing, design, and engagement work with schools, districts, community organizations, youth, and leaders with My Brother’s Keeper Alliance, the Campaign for Black Male Achievement, the City of Detroit, and Detroit Regional Chamber Commerce on the Boys and Young Men of Color Summit which engaged 2,765 boys and young men of color, as well as people who are committed to being part of their village, including 1,872 boys and young men of color, 272 volunteers, 298 partnership staff, and 174 additional community leaders. Over 350 young men walked away with jobs as a result of the summit. We worked extensively with an array of clients (even beyond those listed here), we hired twenty contractors and two specialist consultants, we were doing meaningful work and working alongside our clients to serve, impact, and strengthen communities and missions. In 2016, Hampton Consulting experienced tremendous opportunity and growth and contributed to impact beyond imagination. As the Founder and President of Hampton Consulting, I am proud and humbled to lead this work and to be a servant leader. To all of our clients, we thank you for trusting us with your missions. To all of our supporters and communities we work with and in (in myriad ways), this work would not be possible without you. We are ecstatic as we embark on our second full year journey as Hampton Consulting—cheers to mission-driven work and meaningful, positive impact! Are you a young man of color looking for a job? Do you know someone who is? There's still time to register for the Boys and Young Men of Color Opportunity Summit taking place THIS Monday, November 14th from 9 AM - 3 PM at Cobo Hall. Any young man of color interested in a new career opportunity needs to be there! There will be hundreds of jobs hiring on-the-spot, barbers available onsite, a "tie bar" offering free ties, and professional resume and interviewing resources! Transportation can be made available if you need it, and food and beverages will be provided during the summit. There will also be community, social support, and legal support services onsite, as well as countless other community organizations and employers who are eager to meet Detroit's young men of color. Register today--it only takes 2 minutes! When asked, say the Campaign for Black Male Achievement invited you. Hampton Consulting is thrilled to introduce our two newest Specialist Consultants: Alaina Dague and Kayla Roney Smith! They recently joined the team to support our work with the Boys and Young Men of Color Opportunity Summit, working with My Brother’s Keeper Alliance, the Campaign for Black Male Achievement, the City of Detroit, and the Detroit Regional Chamber of Commerce. We look forward to seeing the impact of their work at the summit and beyond! Kayla has spent four years as Executive Director of the Hazel Park Promise Zone and College Access Network, an organization dedicated to community development through increased educational attainment. Previously, Kayla served as a College Advising Corps member and a program coordinator for the Lansing-based Todd Martin Youth Leadership. Kayla holds a Bachelor of Arts degree in Social Relations and Policy from Michigan State University and will graduate in December with a Master of Social Work degree in Social Policy and Evaluation from the University of Michigan, where she was named a Community-Based Initiative Scholar. For her college access work, Kayla was recently honored by Crain's Detroit Business as one of metro Detroit’s “20 in their 20s”. Outside of work, Kayla holds leadership positions in Detroit Young Professionals, the Young Nonprofit Professionals Network - Detroit Chapter, the Junior League of Detroit, the Michigan Council of Junior Leagues State Public Affairs Committee, and the New Paradigm College Prep Board of Education. Alaina is currently completing a national public policy fellowship with Leadership for Educational Equity at the Michigan Department of Education. Prior to this, she taught middle school English in Detroit; she was recognized for her contributions to student growth with the Michigan Association of Public School Academies' Quantum Leap Award. Alaina previously served as a Volunteer Coordinator for the Alma College Service Learning team, where her efforts were acknowledged by the Michigan Campus Compact's Outstanding Community Impact and Heart and Soul awards. She holds a Master of Arts in educational studies from the University of Michigan as well as Bachelor of Arts in political science from Alma College. In addition, she serves in a leadership role in the Young Nonprofit Professionals Network - Detroit Chapter. Welcome to the team, Kayla and Alaina! Join us on the Karen Dumas Show - live TODAY at 4:30 pM! Hampton Consulting is proud to partner with the Campaign for Black Male Achievement (CBMA) and the My Brother’s Keeper Alliance in hosting the Pathways to Success: Boys and Young Men of Color Opportunity Summit in Detroit on Monday November 14th. Interested in more information? Join Chanel Hampton, President and Founder of Hampton Consulting; Robert W. Simmons III, Vice President of Strategy and Innovation for CBMA; and Frank McGhee, program director at Detroit-based Neighborhood Service Organization, live on the Karen Domus Show tomorrow at 4:30 pm. Listen at AM910 or stream the show online for a conversation about the Summit. We're looking forward to sharing more about this exciting opportunity with you! If you haven't already, Hampton Consulting encourages you to grab your coffee, tea, or water - whatever you need to get going this afternoon - and get out to vote! The Boys and Young Men of Color Opportunity Summit is just ONE WEEK away - Register today! Are you looking for a job? Do you know a young man looking for a job? Don't miss the Boys and Young Men of Color Opportunity Summit next Monday, November 14th! Register today! When asked "How did you hear about the event?," choose Campaign for Black Male Achievement (CBMA).